At one point or another, every Frederick resident is shocked to learn that the Barbara Fritchie House & Museum is actually a 3/4 scale reproduction of Dame Fritchie’s original home. 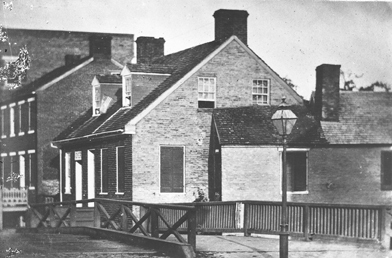 Fritchie’s actual house was severely damaged by a Carroll Creek flood in 1868 (about 6 years after her death) and ultimately demolished. Despite the passing decades, Fritchie’s celebrity continued due to the continuing popularity of John Greenleaf Whittier’s immortalizing poem, recited by countless school children in America and abroad. Years later, the Barbara Fritchie Society purchased the land and had the present house constructed. It was dedicated on July 4, 1927 and for many decades to follow was a well-known tourist attraction in the mid-Atlantic region. The Barbara Fritchie House & Museum is just one of 46 stops on the Frederick Walking Tour. Download the app at itourfrederick.com or purchase the DVD at one of the many fine shops and historic sites in downtown Frederick.